The Yakface Toyguide updates resume with the latest entry in the Star Wars Rebels 3-3/4″ line. Next, we take a look at the Hera Syndulla and Stormtrooper Commander Mission Series set (MS19). PROS: Hera fans rejoice! We finally have received the figure we’ve been waiting for and it doesn’t disappoint. Original solicitation images caused a bit of worry initially because Hera’s green skin tone was very washed out. Thankfully, the production release is a far more vibrant hue. As standard fare for the Saga Legends/Star Wars Rebels line, she has only 5 POA, but it is a well executed figure from paint, proportions and sculpt. Despite having the lekku (aka head-tails), the head is unencumbered by them allowing for a full range of swivel movement. The Stormtrooper Commander is a simple re-accessorized version of the SL01 figure with a non-removable command pauldron, although it does move freely so I’d expect maybe a white or black version in the line’s future. CONS: The biggest con of this set is that it took so long (six months) after the debut of the series to get the main cast/crew of The Ghost. Hera’s blaster is very tiny and she has nowhere to stow it due to a non-functional boot holster so be sure to keep a close eye on it. This set is surely to be a desired one on the secondary market (i.e. eBay or unscrupulous merchants at cons) – but don’t overpay as this set is 2 per case in this assortment and 3x in a revision case. K & C Collectibles has added the new Digital Release Commemorative Collection action figures, Wave 2 – Saga Legends action figures, Mission Series action figures and Rebels Vehicle – Imperial Troop Transport. 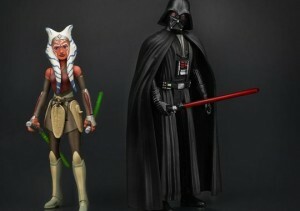 The latest Jumbo Action Figures from Gentle Giant and the current issue of Star Wars Insider #156 Exclusive Previews cover edition. Click the NEW PRODUCT link for a complete list of recently added items. Flyguy and Yakface are back to break down the week’s collecting news and more. This week, product is coming in at record pace with wave after wave of Saga Legends, Mission Series and 6″ Black Series products hit retail. Plus, there are even great sales to be had as well. There are a few very cool customs to discuss this week, the main one grabbing headlines around the world is the drone speeder bike which is too cool not to hit production. Finally, big news broke from Disney involving the first of the standalone films as well as the official release date for Episode VIII. There is a lot to wrap our addled brains around but you can watch/hear it all on Episode 55 of The Realm Recap! Tonight while opening a case of Mission Series figures that I just received from Entertainment Earth, I noticed that Sabine’s helmet had a markedly different appearance than the one(s) I have found at retail. Click on through for the details of this interesting variant. 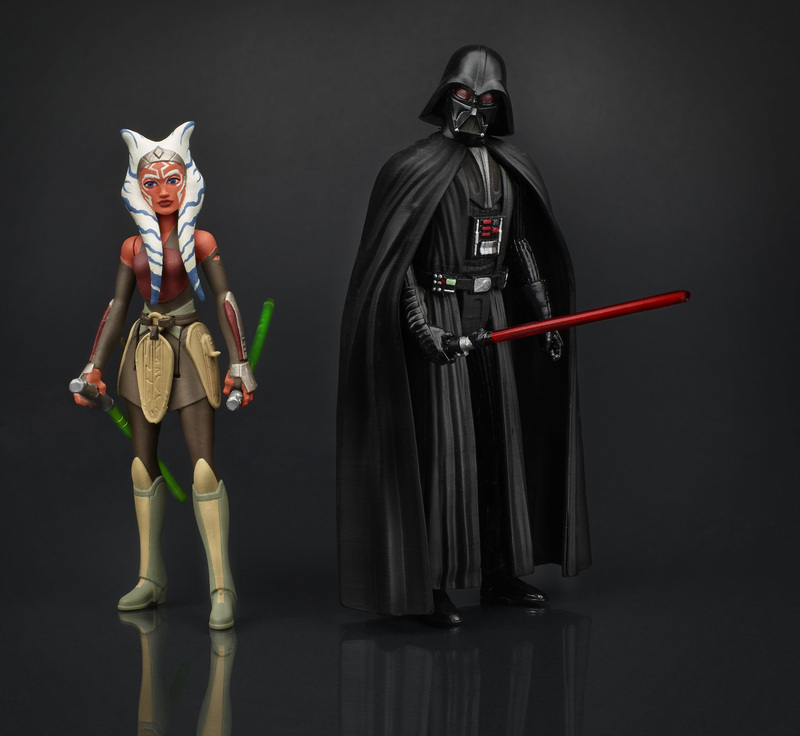 The Yakface Toyguide updates resume with the latest entry in the Star Wars Rebels 3-3/4″ line. Next, we take a look at the Wullffwarro and Wookiee Warrior Mission Series set (MS07). PROS: Honestly, I’m surprised Hasbro went the Wookiee route so soon in the line versus releasing Hera or Sabine upon the initial launch of the line. Alas, the result is a nice set of figures that can serve as diorama filler in displays or customizing fodder. The sculpt and paint is great on these samples as the eyes are dead on as is the mouth – something from which the Chewbacca Mission Series suffered. CONS: Despite being relatively faithful to the design in the show, there is something that feels “off” about them – especially Wullffwarro. I think it is the stubby legs that convey more of a primate or sasquatch vibe than a Wookiee. No weapons??? Even a simple stormtrooper blaster would have been nice. Sadly, I think these may pegwarm once more stores get their allotment. Like most Wookiee figures, articulation is an issue (even more here considering the 5 POA style) as the head is virtually immovable with only the slightest bit of swivel possible. The Yakface Toyguide updates resume with the latest entry in the Star Wars Rebels 3-3/4″ line. 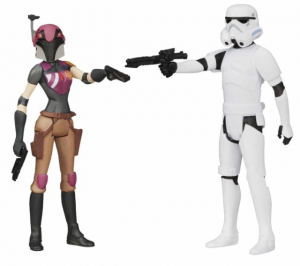 Next, we take a look at the Sabine Wren and Stormtrooper Mission Series set (MS08). PROS: Finally! We are one step closer to getting the entire crew of the Ghost and our intrepid rebel heroes. 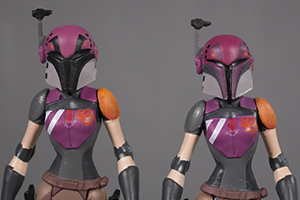 This set features the debut of fan favorite Sabine in her custom Mandalorian armor. Despite not having a removable helmet, the aesthetic of the figure is spot on. The sculpt of the figure has a certain amount of attitude with what looks like slightly cocked hips. Sabine also benefits from functional holsters to stow her twin blasters. The Stormtroper is a carry forward from previous releases with some variance in deco quality in the various sample I’ve seen, but having more “bucket heads” is always welcome. CONS: The biggest con (other than less than stellar availability right now) is the fact that Sabine doesn’t have a removable helmet. They gave one to Erza – why not her? Hopefully Hasbro can revisit this figure soon with that feature. Yeah, yeah, articulation is limiting but that shouldn’t dissuade you from adding her to your collection. Finally, her blasters are very tiny so if the intent is to let kids (boys and girls) play with her, might want to keep an eye on those accessories. 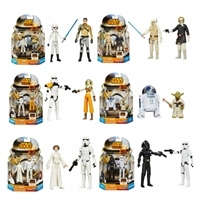 DorksideToys has opened preorders for wave 3 of the Mission Series sets which include Hera/Stormtrooper Commander, TIE Pilot/Stormtrooper, Ezra (Cadet Disguise)/Kanan Jarrus, Luke Skywalker (Hoth)/Han Solo (Hoth), R2-D2/Yoda, Princess Leia/Luke Skywalker (Stormtrooper Disguise). Preorders are available by the set or individually. Expected arrival March 2015 – subject to change. Episode 51: What’chu Tarkin ‘Bout? Join Flyguy and Jayson as we break down the latest in collecting news from Hasbro including the continued findings of Rebels product at retail and online, speculation of a 6” “kids line” of figures and an update on the West Coast shipping situation. Kotobukiya has released info for their Celebration Anaheim exclusive – are they the droids you’re looking for? Plus we run down a slew of new custom pieces as well the latest in Rebels, Force Awakens, spin-off news and more all on Episode 51 of The Realm Recap! Our friends at JediDefender alert us that the Sabine Wave of Mission Series packs are in stock on Amazon.com for $10.99 each. UPDATE: Many of these are sold out at the $10.99 price but are still available at “elevated” prices.